Choosing the right supplies for your office, whether at home or at your workplace, can help you work more efficiently. This is especially true when it comes to choosing the right storage units. Filing cabinets come in many different sizes and they are designed to hold files upright so you can organize them and access them easily. A filing cabinet works well for those who work at home or in an office away from home as they can hold as many papers as you need. Filing cabinets come in many different sizes and configurations. If you have an at-home office you may not need a large filing cabinet with many drawers. Plus, if space is limited you’ll have to choose a more compact cabinet that doesn’t require a large space in your room. 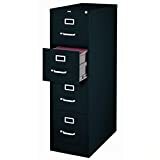 Those who have a large office and need the space to store and organize many files would benefit from choosing a large filing cabinet that has several drawers for storage. 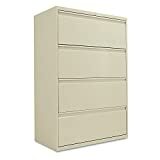 The following is a list of 10 office filing cabinets that can help you organize your office. The Calico Designs File Cabinet in Black has 2 small drawers on top with a larger drawer on the bottom. 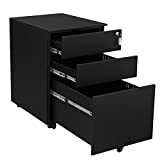 This 3 drawer unit has a sleek design that can work well in any office setting. This unit has a lock with 2 keys that allows you to keep your sensitive information safe and secure. The file cabinet can accommodate letters or legal size files. It has 5 casters so you can move it around as needed. The addition of a caster on the file drawer helps prevent the drawer from weighing down the unit when it’s pulled out of the cabinet. The cabinet is lightweight but sturdy and made of durable materials. The Monarch Specialties Dark Taupe 3 Drawer File Cabinet has a stylish reclaimed wood look. The unit has 3 spacious storage drawers to hold all your essential files and papers. The bottom drawer has the ability to hold your files upright so you can keep them organized and always see where everything is. This file cabinet from Monarch Specialties can easily coordinate with the brand’s other Dark Taupe reclaimed pieces for a complete office look. The unit has 5 casters so you can easily move it around as needed. The center caster is attached to the bottom drawer which helps prevent the drawer from tipping over when pulled out completely. The Hirsh SOHO 3 Drawer File Cabinet comes in a stylish charcoal color. This cabinet has one small drawer for keeping supplies like pens, pencils, staplers, and other necessities. The two bottom drawers are both designed to hold files and folders upright for easy access and organization. This file cabinet would work well in a home office or your workplace. It has the ability to store more files than many similar style 3 drawer cabinets. The bottom drawers can hold hanging files without any type of assembly or additions to the drawers. One of the drawers can be locked for security. The Alera LF3029LG Two-Drawer Lateral File Cabinet works well in spaces with limited room for storage. This cabinet has a lock at the top to keep personal items secure and safe. The unit can be stacked with other cabinets of the same type for convenience. This file cabinet has a modern and minimalist look with a light gray finish. It’s made of durable materials and can hold many files, papers, and other essential items. The cabinet has rails inside the drawers so you can easily organize all your hanging files. 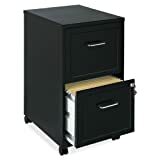 The Scranton and Co 4 Drawer Letter File Cabinet comes in a stylish black color. This cabinet is commercial size and would work well in a professional office setting. The 4 large drawers are designed to hold letter size papers. You can store your files upright so that they’re organized and easy to find when you need them. This file cabinet from Scranton and Co has high side drawers that are able to hold hanging files without any additions to the cabinet. The drawers are equipped with precision steel ball bearings for a smooth and quiet motion when you open and close them. The Lorell Mobile Standard File with Lock has a convenient sliding lid that gives you easy access to all your important files. The files can hang in the unit so that you’re able to organize them in hanging folders. The lid has a piano hinge top making it easy to open and close. It also has a lock so that you can keep sensitive files and information secure. 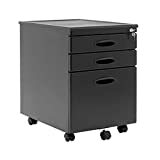 This convenient file cabinet has casters so you can move it around the office as needed. It also has a shelf at the bottom where you can keep some essential items. This cabinet is lightweight, weighing only 25.6 pounds, but it’s made of durable materials and designed to last. The SONGMICS Steel File Cabinet has 3 drawers for storage. This cabinet is equipped with a lock so that you can lock up all your important documents and keep them secure. It’s made of durable steel and designed to last whether used in a home office or a professional office setting. 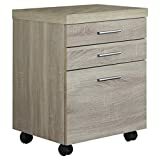 This file cabinet has casters on the bottom so you can move it around easily, even when it’s full. It has a center caster that helps prevent the drawer from tipping over when it’s pulled all the way out from the unit. The bottom drawer has hanging rails so you can keep all your hanging files organized and always within reach. The Hirsh Industries 18″ Deep Steel File Cabinet has 3 drawers for lots of office storage. The cabinet is made of durable steel and has a stylish white finish. It has a small drawer on top that can store pens, pencils, staplers, and other office essentials. The bottom 2 drawers are both designed to hold hanging folders to keep your files organized. This steel file cabinet has a locking design with a key so you can keep your files safe. The drawers are designed with a smooth glide motion for quiet and easy opening and closing. The cabinet weighs 24.5 pounds when empty. 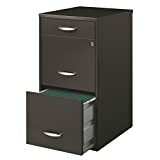 The Lorell 2 Drawers Vertical Steel Filing Cabinet is designed to accommodate letter sized files. It has two large drawers with a depth of 18″. Both drawers are designed to hold hanging files with no additions. It comes with 25 hanging files and 18 tabs to organize and label your files. This durable steel cabinet comes with a lock and key so you can easily secure your files. It has curved pull handles for convenience. The durable baked enamel finish is designed to hold up to heavy duty usage in your home office or professional setting. It has a smooth top that allows for extra storage space in your office. 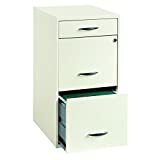 The Lorell 14341 2-Drawer File Cabinet is made of durable steel. This cabinet comes in a white or black finish. It has 2 letter size drawers that can fit your important files on hanging rails. This helps to keep everything organized and easy to reach when it’s needed. 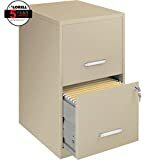 This file cabinet from Lorell has a smooth glide suspension to keep the drawers from sticking or making excessive noise when you open them. The cabinet has a sleek design that makes it easy to fit in with your office decor and furniture. The cabinet is able to lock so you can keep your files safe. Office furniture should be both stylish and functional. When it comes to filing cabinets, most are made of metal and designed to blend in with your other office decor. There are many options for filing cabinets available. The best one for your space will depend on the amount of storage you need and the space you have. Most units have 2, 3, or 4 drawers. If you need to have easy access to your important files you should make sure that at least one of those drawers can hold hanging files. Some filing cabinets are equipped with a lock and key so your important information is kept secure. Some cabinets are on casters so you can easily move them around your space. It can be helpful to have a caster that extends with the bottom drawer as it will help keep the entire unit from tipping over when the bottom drawer is fully open. You may want to read online reviews from other consumers who have purchased and used the cabinets you’re looking at. This objective information can help you choose the best option for the money you wish to spend.